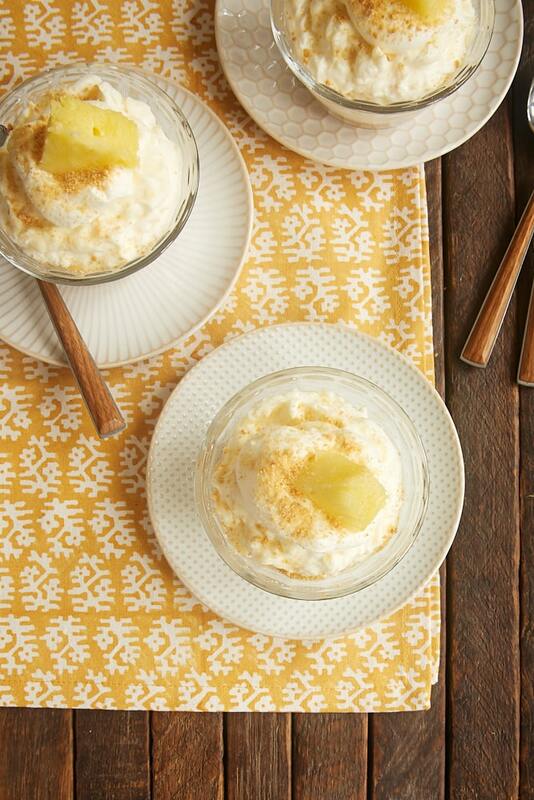 These No-Bake Pineapple Cheesecakes are wonderfully sweet, tart, and creamy. 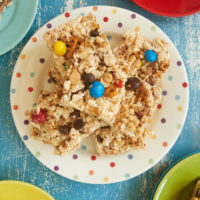 A great make-ahead dessert that scales easily! 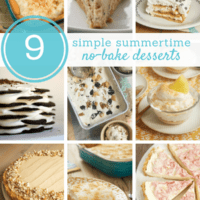 Sometimes I think that I prefer no-bake cheesecakes to their baked counterparts. All that creamy, fluffy cheesecake is just so irresistibly good! I especially love to make them in warmer months when the thought of baking a cheesecake for a long time is just too much to fathom. 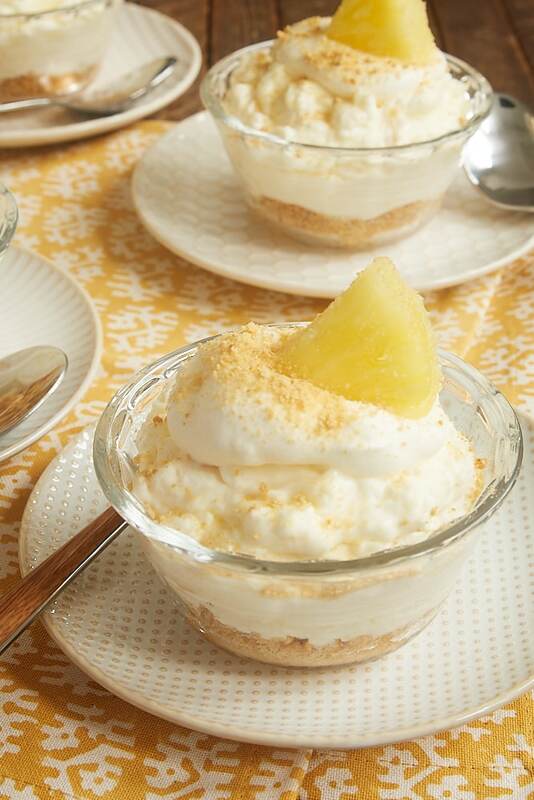 These No-Bake Pineapple Cheesecakes hold up to the creamy, fluffy requirements very well. 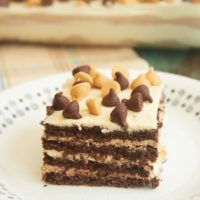 In fact, these are even more fluffy compared to most of the no-bake cheesecakes I make. A little extra whipped cream gets folded into the cheesecake mixture to make them a bit lighter and fluffier in texture. As for the flavor, this sweet, tart flavor combination is pretty fantastic. The pineapple flavor here is not overwhelming. 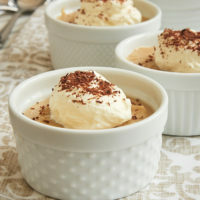 Instead, it gives you that bit of tart flavor along with the sweetness of the cheesecake. I use crushed pineapple for a smoother texture, and I also like to add a little bit of the pineapple juice to bump up that flavor. 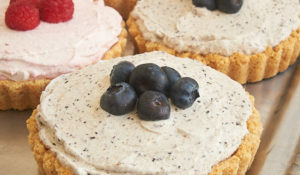 These individual cheesecakes are so easy to make with zero oven time required. 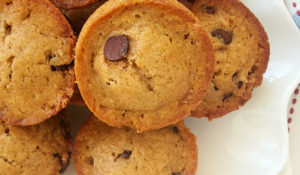 They are such a great make-ahead dessert! And if you need more servings, the recipe scales easily for more servings. There’s plenty of cheesecake filling in each of these, so you can even use the recipe as is and choose to scale back how much is in each serving and make a couple more servings. If you’d prefer to make this recipe as a 9-inch cheesecake in a pie or tart pan, you can certainly do that. Use my basic recipe and tips for making a 9-inch cookie crumb crust. Then double the filling to fill the crust. 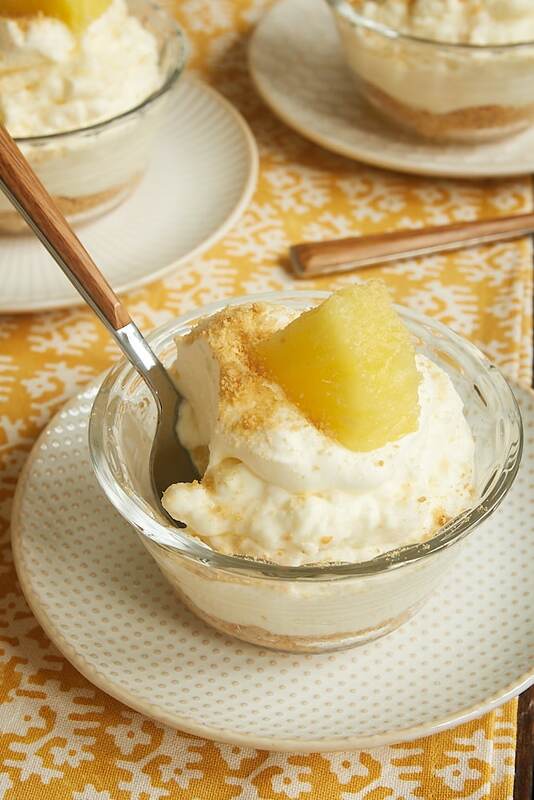 To dress up these No-Bake Pineapple Cheesecakes, I like to top them with a little sweetened whipped cream, a slice of pineapple, and a little sprinkling of graham cracker crumbs. Other toppings work well, too. Try some chopped nuts, toasted coconut, or even a few blueberries. Or just serve them as is to make things even simpler! These No-Bake Pineapple Cheesecakes are a fantastic combination of sweet and tart in a creamy, fluffy cheesecake. 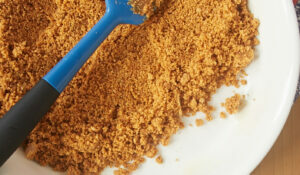 Combine the graham cracker crumbs and butter until well mixed. Divide the mixture among 4 individual serving bowls with about 1/2 cup capacity. Press gently into the bottom of each bowl. 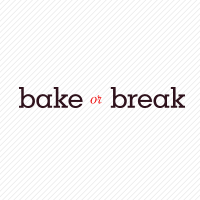 Using an electric mixer on medium speed, beat the cream cheese and sugar until thoroughly combined and smooth. Mix in the pineapple and juice. 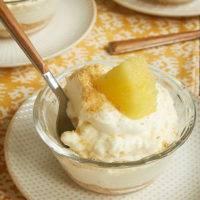 If desired, top with whipped cream, pineapple, and graham cracker crumbs. nutritional information like calories, fats, sugars, carbohydrates,etc? Hi, Deanna. 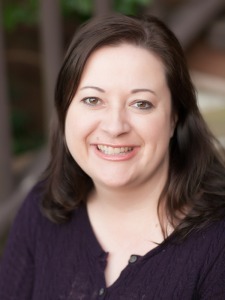 I don’t provide that information, but there are several sites on the internet that will generate nutrition information. I love the idea of combining pineapple with cheese! Looks and sounds so delicious and perfect for the summer! If using the full amount, why not fold it all in at the same time. Hi, Nancy. Step 3 of the cheesecake says to fold in 1/3 and then fold in the remainder. It’s a good idea to fold in only part of the whipped cream first so that it’s less likely to get over-mixed and deflated. You want to keep the whipped cream as fluffy as possible!